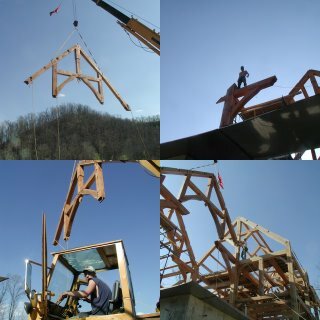 The picture collage to the right shows the sequence for how we raised this bent. 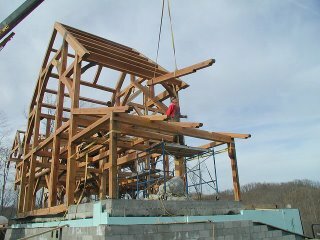 It was critical that we got the hammerbeams themselves lined up, so that the feet of the rafters and queen posts (hammerbeam posts?) would sit on the hammerbeams without a lot of mid-air adjustments. 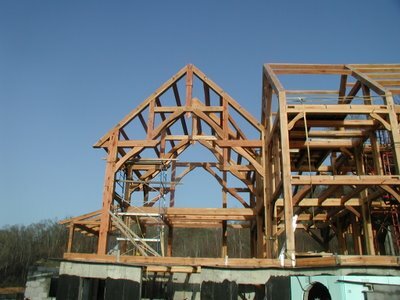 Perhaps you can see the stringline that we used to line up the hammerbeams in the pictures? Fortunately for us, it lined up fairly well, so the hammer beams required only a little bit of hammering before the hammer posts dropped into their housings. The peg holes were pre-drilled, so 10 tapered pegs were all that was needed to bring the bent together that last 1/4 of an inch. Before digging our foundation, I oriented our house exactly in line with the sun at high noon. To do this, I went on to weatherchannel.com and found the sunrise and sunset for our zip code. (you can do the same with a GPS unit that gives sunrise and sunset). I then divided the difference by 2, and added that to the sunrise. That gave me the exact minute that "noon" happens at our location. I put a very long pole in the ground, careful to keep it vertical, waited for exact noon to happen at our location, and recorded the shadow line cast by the vertical pole. I then aligned everything in the foundation, according to the shadow that was cast on the ground at high noon. This was very important to us, because we plan to have solar panels on the roof of our house, and will use the windows on the south side of the house to gain some heat in the winter from "passive solar gain". (BTW, most windows nowadays are glazed so as to limit solar heat gain, so we had to order special windows for the south side of our house - but that's another article). There are no diagonal (wind) braces in the exterior walls of this room. The main reason that I left them out is that they interfered with the windows and and french doors. 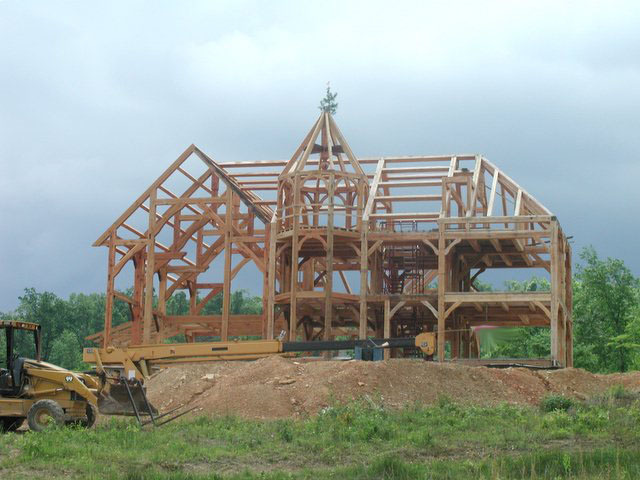 My wife especially hates pictures of timberframe houses with braces in front of otherwise unobstructed windows. (I have to agree with her - seems like poor planning). But won't the room be shaky or flimsy? Well, partly I'm relying on the fact that this relatively small room is tied to a very stout structure, and partly I'm relying on the SIPs that will enclose this room to add stiffness. In the picture, you can see that we we are flying the last rafter in to place. About 2 hours before this picture, we were scratching our heads because the rafters were not fitting at all. I had forgotten to notch the top plate to accomodate the rafters. The top plate was already in place, so we had to notch it in right there while standing on the scaffolding you see in the picture. Whoops!